When I typed in the post title I was also thinking of "Rome" the TV miniseries. C, who doesn't have a TV in her London flat, had brought it over and we spent the weekend watching the first season, as a sort of prelude to our trip. It's a HBO/BBC production therefore has both glamour, flash and solid acting, and of course a sumptuous line up of male characters; my top three favourites are "woah, yummy" Lucius Vorenus, passionate and oh-so-manly Titus Pullo and of course the powerful Julius Caesar. The second season is available in the shops but I am happy to wait for a while. Because now I have figured out (better late than never) that French TV prime time starts from 8.40 pm and in the two hours that follow there is usually something watchable on telly. Tuesday nights poses a big problem: would it be Brothers and Sisters or War and Peace? The former I had been following against my better judgement because the combination of three attention-seeking divas (Sally Field, Calista Flockhart and Rachel Griffiths) irks me but Rob Lowe is in it though not as often as I would like. War and Peace, or Guerre et Paix as it is known here, is a major European production- 6 countries involved in the production including France of course, filmed in St Petersburg plus various beautiful locations. Natasha is played by very up-and-coming French actress Clémence Poésy. They'll show it on local TV in four weekly installment. I had actually watched my first episode in Rome, it was subtitled in Italian but I could figure some words out and the plot develops quite fluidly, so for this week we're OK, but how about next week? I could watch War and Peace and follow the repeat of Brothers and Sisters on Sundays but sometimes they transmit the Sunday version in French which is a bit of a pain. Decisions decisions. That's the problem with too many choices. 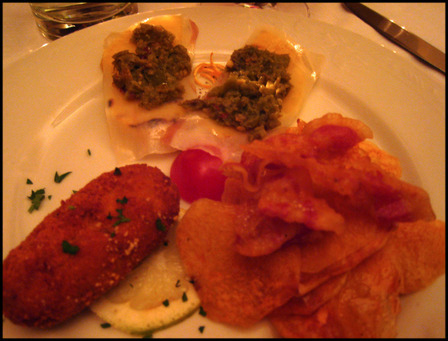 When we saw the antipasto spread at La Campana (Vicolo della Campana, 18 T: 06 686 7820) C and I decided we were going to share a plate, and I was tasked to do the selection. In my younger days I would have tried to pile my plate high but now I am a bit more self-conscious, boy it was difficult to choose, everything looked and smelled so appetizing and tasted mamma-mia delicious. Grilled okras, spiky green cauliflower, aubergines, peppers, sardines, runny omelets, all bathed in herbs and olive oil yet each item held their own interest and no two tastes were alike. My friends, if you are ever in the same situation don't go all prissy like me, just abandon yourself and fill the plate to the brim. For this trip I was in charge of food and shopping. C for the sight-seeing. Food was easy for me, I asked the legendary Chaxiubao for advice and he came through with a list. From the list I made reservations for four meals and e-mailed C with the news who was mighty impressed. The second night we went to Al Bric (Via Del Pellegrino, 51 T:06 6879533). This was an intimate and secluded place, the signboard is hardly visible and from the outside it looks like a dusty wine shop. The food was impeccable, the wines most excellent and I'll elaborate more on what we eat in later posts. Here it suffices to say that I enjoyed my appetiser of three items. A croquette of salmon and potatoes, fresh tasting and expertly fried. A mille-feuille of hand cooked potato chops with special bacon. Polenta cakes with a film of something white, most likely lard as C suggested, and topped with a pesto of spicy green peppers and lemon zest, unexpected combination that excited the palate. 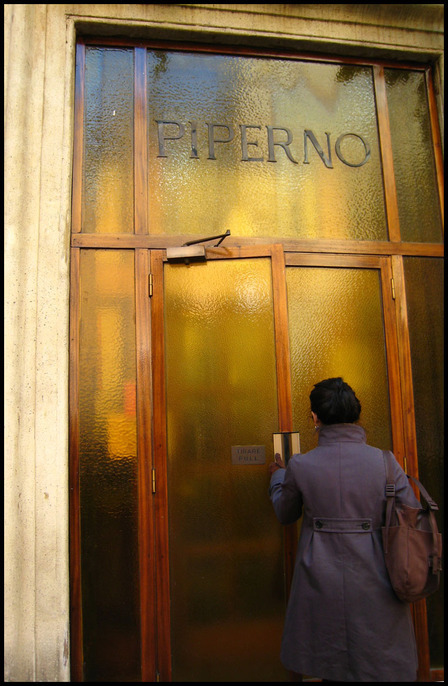 Piperno was another winning recommendation. 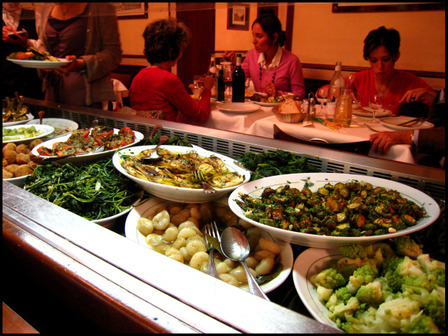 By the third day we have figured out the style of Italian cooking in Rome is actually quite rustic and heavily influenced by Jewish cuisine, the guide book even called it Roman-Jewish. I am sure Rome has its share of nouvelle fashion restaurants with dainty presentation and elegant plating but what we ate were mostly of the old fashioned basics which are satisfying but may not win any points on presentation. And none came more old-school than Piperno. Located deep inside the Jewish quartier, it was not easy to find without a map and the external experience belies the fact that once we push through the door, inside is a world of gentlemanly waiters in waistcoats and white aprons, glittering chandeliers, lush paintings, thick linens everywhere and where Italian old-moneyed families hang out especially on the Sunday afternoon that we visited. Very atmospheric, definitely. Their specialty is, as chaxiubao noted, fried (fritto) foods. C and I ordered the vegetable version because she was intent on eating artichokes and me on zucchini blossoms. The artichokes were absolutely delicious, now that artichokes are everywhere I wished I ate more of it that day. 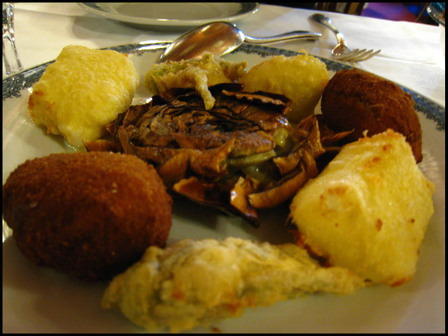 The fried balls looked alike, but they are not the same, one had rice and the other had potatoes. Everything was delicious, the batter bound the ingredients loosely and lightly and the frying was so expertly done you'd think they didn't use oil. Antipastos are meant to be delicious little morsels to excite the palate for the meal proper but which in themselves make great meals. Do you think the Italians have a separate stomach for antipastos? I think they do, their digestive system must surely have evolved to that level.